If there were awards for slowest decorator on the planet, surely I would be a top contender. Often times I stand in awe of those who seem to finish rooms at break neck speed. How do they do it? I mean they just moved into a new place and wham...rooms are pulled together and posted on IG lickity split. Now, I can produce styling results for magazines at a pretty steady pace (mainly because there is a deadline) but choosing items for my own home takes time. Apparently lots of it in my case. It's not that I'm not looking for items that make a house a home, it's that I'm looking for vintage, antique, or one of a kind items. And there in lies the rub. Finding antique furniture that fits a certain height, width, depth, as well as having simple lines and timeless style isn't something I'm going to find easily. And I've learned to let the process be what it is - an investment in patience. When we built our house I made the conscious decision to not add built-in cabinets in the bathrooms. Instead I wanted to use antique pieces for our storage needs. I feel they add an element of surprise and incredible character to small spaces. 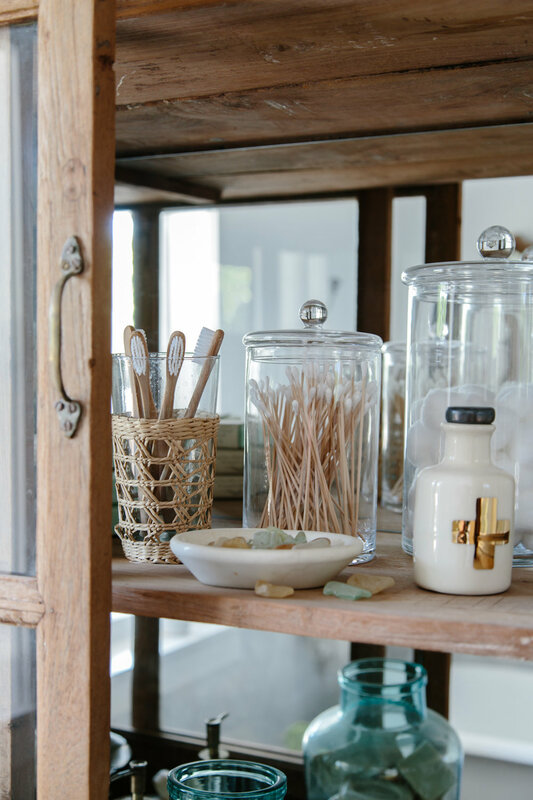 This tall glass and wood cabinet was the perfect piece for our main guest bath. When we brought it home I decided to have mirrors cut for the back in order to bounce light from the nearby window. This helped the piece from appearing too heavy and dark and the added light showcases my apothecary collection beautifully. 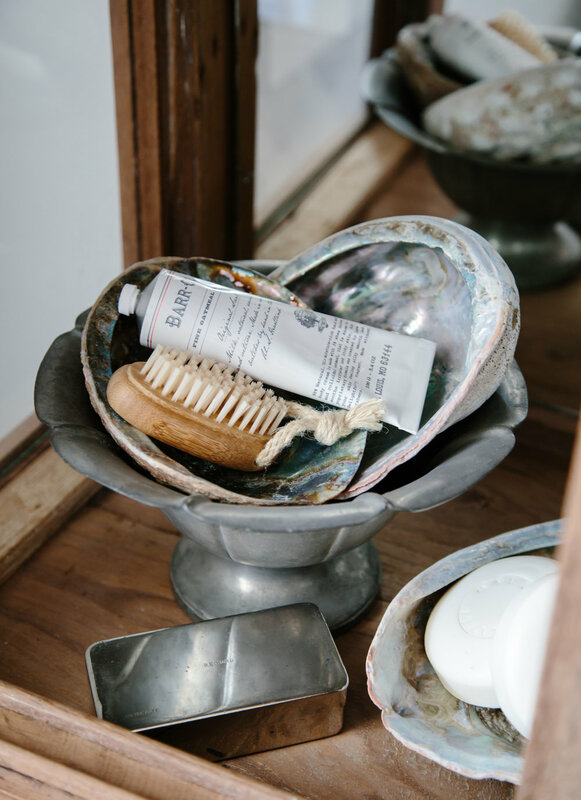 The lower shelves allow me to keep stacks of fresh towels and extra soap and a mix of found shells or elements from nature. 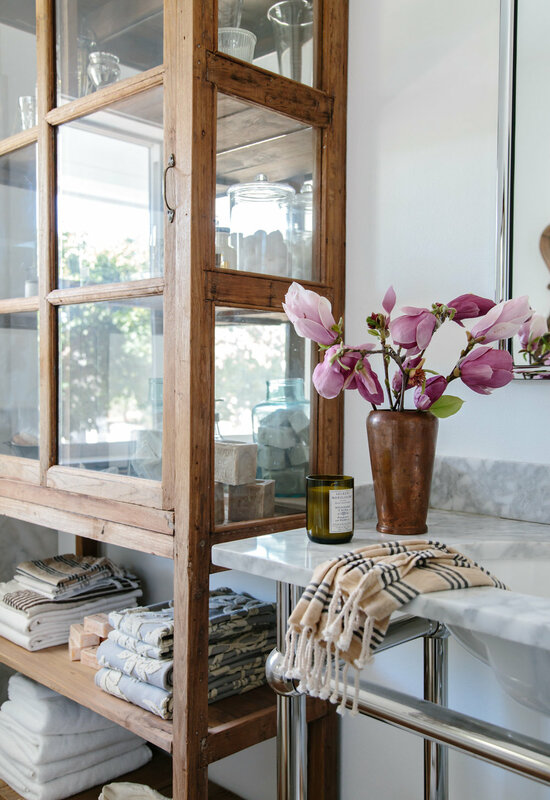 I often pick up Turkish towels on my travels or while I'm out prop shopping but my favorite online source is Indigo Traders. The gray sculpted towels on the right (Anthro knockoffs) have sadly been discontinued but these, these and these are very similar and all are on sale! The antique baroque French mirror came with us from our old house. I've had it for years and was glad it felt at home in this space. I was afraid it would be a little fussy but think it provides such beautiful contrast. I especially love the patina of the well worn silver backing. 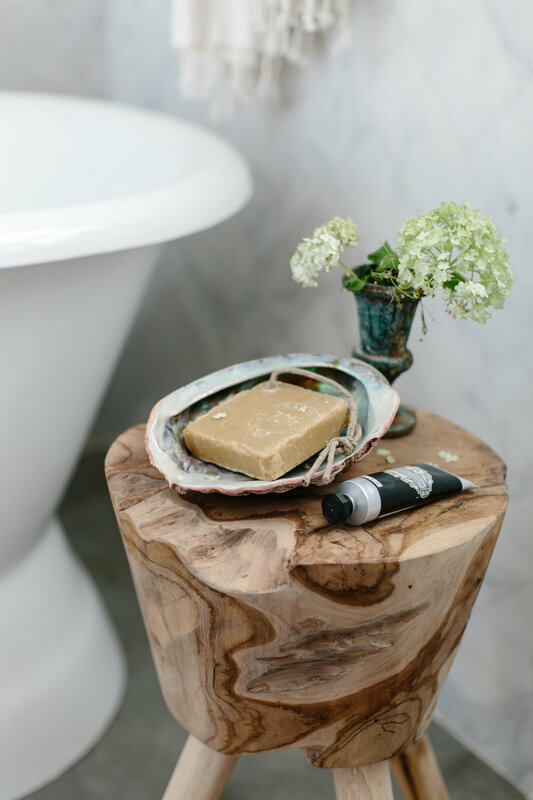 The burl wood stool below was a lucky HomeGoods find. Some sort of gauzy linen shade for the window. 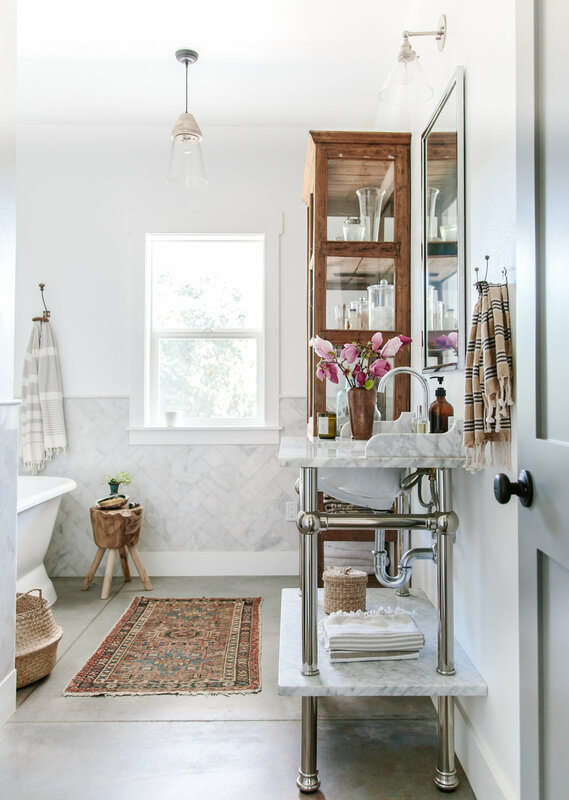 A gorgeous mirror for over the sink. The current one is just a place holder. Small wall cabinet in the water closet (not pictured) for toilet paper and such. Possibly a longer antique runner. Finish the concrete baseboard behind the tub. You can see where it stops in the first photo. How about you? Can you pull a room together in no time or are you more like me...turtle pace. Between posts you can find me on Instagram sharing highlights of daily life. If you'd like new posts delivered to your inbox you may subscribe here.